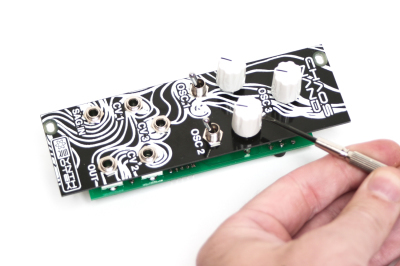 Welcome to the Eurorack version of our Chaos Nand Eurorack Version. Please follow the instructions in order to make assembly easier. There are some tricky mechanical parts, so go slowly and read everything before attacking this project. Also please do not refer to the photos alone! Follow the BOM and our capacitor and resistor look up guides as the color of some components can change. We update the BOM with the most up-to-date values, which will result in the best sounding product by our standards. Lets Begin! If you’ve received your parts and ready to build, the first thing you should do is to check to make sure you have all the parts. 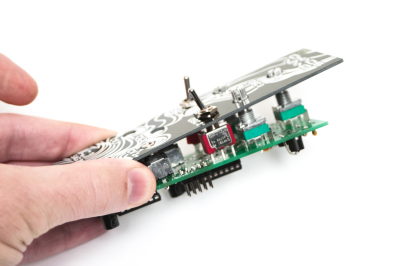 Check your kit against the Eurorack NAND BOM. If you’re missing anything we’ll send it to you free of charge. 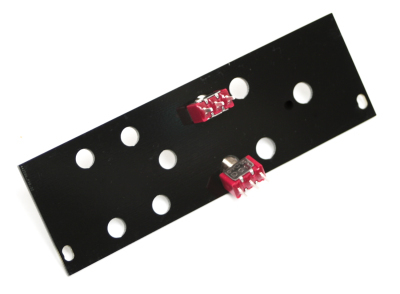 Next, Place the 2 IC sockets into place by aligning the notch on the sockets with the notch on the PCB silk Screen. Turn over and solder in place. Now populate and solder in place the Ceramic Capacitors. These are not polarized, so you can place them in either way. Trim leads after soldering. The electrolytic capacitors C5, C6, and C7 are polar sensitive. Make sure that the longest lead from the electrolytic capacitor goes into the hole marked with the plus (+) sign. Solder and Trim. Now lets install the voltage regulator and Vactrols. 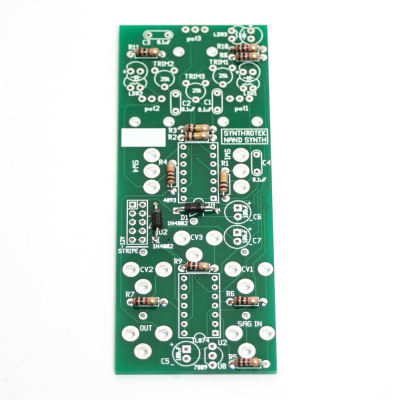 You need to align the flat side of the voltage regulator to the image of the flat side on the PCB silkscreen. 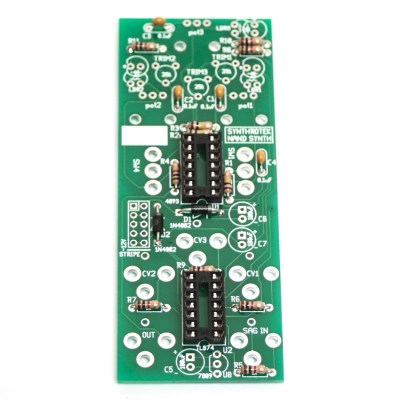 The Optocouplers are polar sensitive and must be soldered in the correct orientation or your circuit will not work. On the black cylinder of the Optocoupler is a small dot or marking. You need to make sure that the marking is aligned right next to the marking on the PCB’s silkscreen. Also make sure that the long leads that wrap down are not touching each other, otherwise they will create a short and the circuit will not function. Now install the 10-pin header as shown above and solder on the other side of the PCB. Next CAREFULLY (as to not bend the pins) install the IC’s into the headers by aligning the notch in the IC’s with the notch on the headers and PCB silk screen. First, trim the placement metal nubs off the pots to ensure that the panel fits flush. Without Soldering any of the jacks, pots or switches yet, take your 2 toggle switches and slightly thread them onto the panel as shown above. Next, place the panel over the project and proceed to tighten (not too hard!) all of the nuts for the jacks, pots and switches. This will keep the panel straight and inline with the PCB. NOW! 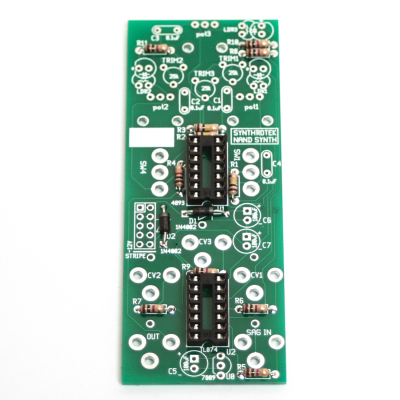 You can turn the project over and solder the jacks, pots and switches to the PCB. Congrats! You are now done and your unit is ready for testing! 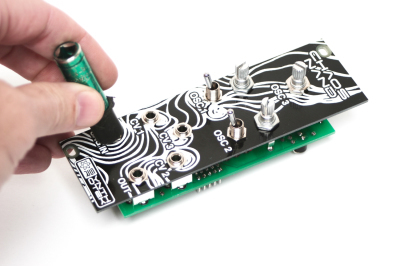 Install into your Eurorack case and make some noise! Have fun! Set all 3 OSC knobs fully counter clockwise, and set both OSC switches to the DOWN position on the Modular Chaos NAND. When you monitor the output, you should hear a square wave that can be anywhere around A#3 (230Hz). Slowly turn the OSC 3 knob clockwise and you should notice the pitch rising up past 20kHz. Now set the OSC 3 knob fully counter clockwise. Set the OSC 1 switch to the UP position (turning on Oscillator 1). The pitch should be anywhere around 45Hz (between F1 and F#1). Slowly turn the OSC 1 knob clockwise and you should notice the pitch rising up past 20kHz. Now set the OSC 1 knob fully counter clockwise and set the OSC 1 switch to the DOWN position. Set the OSC 2 switch to the UP position (turning on Oscillator 2). The pitch will be pretty low, somewhere around 60Hz. Slowly turn the OSC 2 knob clockwise and you should notice the pitch rising all the way up until somewhere around 10kHz (it might be hard to tell as OSC 3’s audio is constantly going) it will drop in pitch when the OSC 2 knob is set fully clockwise. Now set the OSC 2 knob fully counter clockwise and set the OSC 2 switch to the DOWN position. 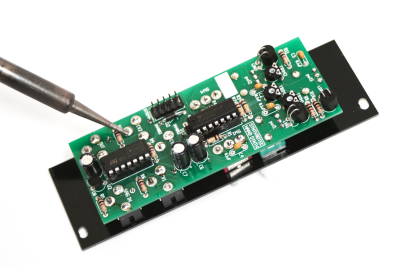 Take a 10V+ Envelope, Gate, or an Offset and plug it into the CV 3 INPUT. Turn TRIM3 almost fully counter clockwise until the frequency goes just out of audible range when the CV INPUT signal is at 10V+. Set the OSC 1 switch to the UP position. 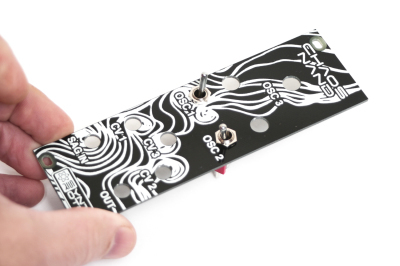 Take a 10V+ Envelope, Gate, or an Offset and plug it into the CV 1 INPUT. Turn TRIM1 almost fully counter clockwise until the frequency goes just out of audible range when the CV INPUT signal is at 10V+. Set the OSC 1 switch to the DOWN position. Set the OSC 2 switch to the UP position. 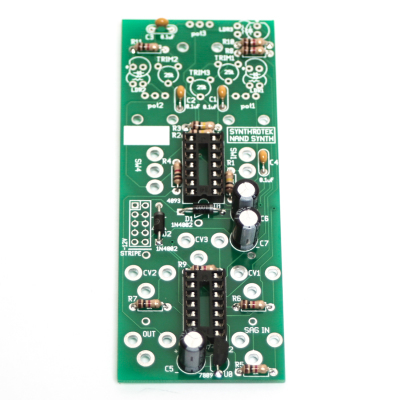 Take a 10V+ Envelope, Gate, or an Offset and plug it into the CV 2 INPUT. Turn TRIM2 almost fully counter clockwise until the frequency goes as high as it can when the CV INPUT signal is at 10V+. Set the OSC 2 switch to the DOWN position. By now you should be able to confirm that the Modular Chaos NAND is working correctly. We love to hear back from our customers about how they’re putting our products to use! If you run into any issues, please consult our TROUBLESHOOTING GUIDE. Optocouplers are polar sensitive ??? no luck finding them . Do you have a part number for the bourns pots. There seems to lots of option with mouser 100K bourns. hello, just a few questions about the parts. im new at this..so i`m sorry if questions seem dumb. 1. Can i use diode 1n4003? 2. 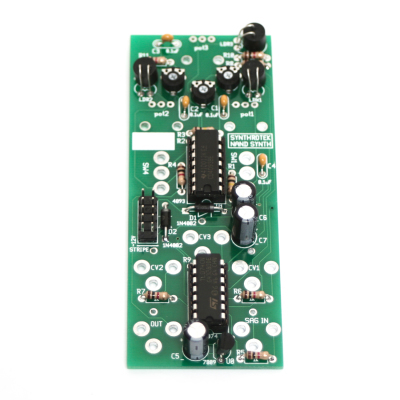 LM7809 – is the same as LM78L09 9v regulator. 3. For the diy vactrol should i use any color of led? are there further modifications required if i use the homebrew vactrol? 1. Yes, the only difference between the two diodes is the reverse voltage, and the 1n4003 is higher rated, so you’re good to go. 2. yes, any 9v regulator that has the same leg pinout should work fine. 3. When making a diy vactrol, the different colors of leds are going to have different effects on how the vactrol will work, but we haven’t done sufficient research into them to be able to say what the effects of using different leds are. What are the trimmer pots for? I don’t see anything that explains what they do, or a schematic so I can figure it out? Yellow leds usually work best for vactrols. It’s really important to make sure they’re completely hidden from light to get more range. What is the ideal value on the octocouplers? I found a company that carries them but they offer quite a range. Do the IC versions work as well as the ones that you guys use (as in photo)? Any vactrol that is in the 400ohm when on, and 150k to a few megohms when off should be fine. I don’t really know if the IC versions would work or not on this circuit, but if its around the same value for the same voltage levels, I imagine it would work fine. 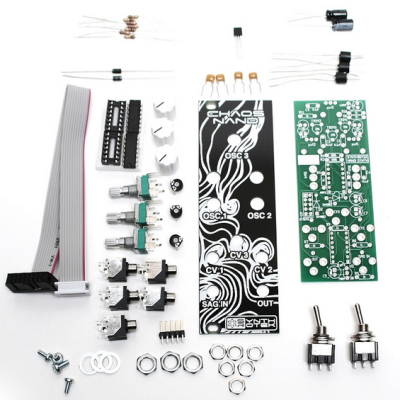 If I make a mistake building this could I damage my eurorack case power supply/the other modules I have? Or will it just not work and possibly only break this module? This could depend on a few things. 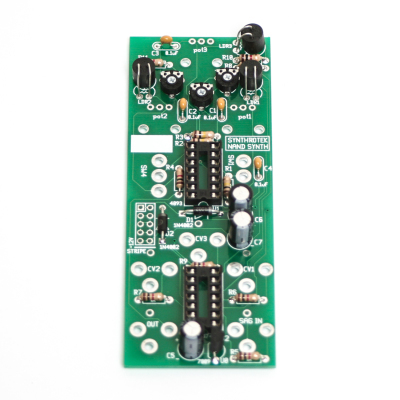 For one, if you’re using our Deluxe Power or 5A power supplies and one of your modules is causing in a short, the power modules themselves with shut off which is intended to protect other modules in your system. If you see the power modules flashing rapidly, turn off your system and disconnect your module. Turn your system back on to double check that no damage was done. Fortunately, I haven’t personally seen anyone damage their entire system from plugging in a faulty module. There has been a few occasions when people plug their ribbon cables in backwards which is an easy mistake to make when you don’t have a distribution board with shrouded headers. That is something to also be aware of with the NAND synth. 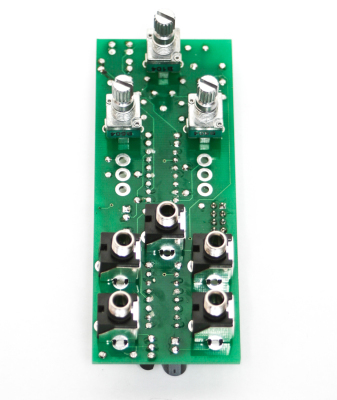 It does not have a shrouded eurorack header like most of our modules. Be sure to line the red strip side with the -12v pin. It should be well labelled on the NAND PCB. Is there a suggested starting point for the trimmers? You can adjust the trim pot for the level of CV you want to have an effect on the nand. You could adjust it for a small amount of CV control over the parameter or you could adjust the trim pot so that CV has a wider range over the parameter your controlling. Recently built one of these. Everything seems to be working except for CV 3. I tried adjusting the trim knob to no avail. Any idea where I should go poking around to find the issue? I would suggest testing the vactrol that goes with CV3. If that seems to be working ok, give us a call at 503-417-1130 or shoot us an email at store@synthrotek.com and we’ll dig deeper. How does the SAG IN work? What exactly is the CV doing at this entrance? Or audio in? Hi Rico, the SAG is just another way of indicating that you can power the device via Control Voltage. It is really just allowing the voltage that is powering the whole unit to be variable, this changes the oscillation frequency. Another important thing I do not understand. The connections of the jacks are with switching contact, is it important to solder them to GND or can I omit them? When audio out, GND is not connected? I’m sorry, I can not answer the CV inputs. The pots work well on audio out but CV is not a reaction on all 3’s. Even with the trimmers nothing changes. The SAG-in makes the output signal quieter. You want to solder the grounds. The switch is not used on all the jacks. I noticed that it takes awhile to show the CV input response. It is probably due to a capacitor that takes too long to charge. But I’m not clear with the picture without a schematic ….